A Virginia-based energy company is relying on advanced data visualization, geospatial data and visual analytics to stay a step ahead of thieves who’ve taken a shine to copper wire. Like gold, the price of copper has skyrocketed in recent years. But the increase in copper demand that is fueling the rising prices has become problematic for many businesses, including energy companies. And for some, one of the ways they’re fighting back is through the use of advanced data visualization tools. 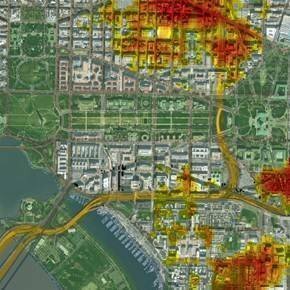 This satellite image of Washington D.C. with analytic hotspot overlays is an example of an advanced data visualization that uses geospatial data and analytics to visualize certain patterns. The image shown here was created by GeoEye Inc. based on information collected in April 2010. “We, like everybody else in our business for the past few years, have had a growing and chronic problem with the theft of copper,” said Dan Jenkins, director of corporate security for Richmond, Va.-based Dominion Resources Inc., an electric and natural gas utility that serves customers in 15 states. Building construction and electrical and electronic products -- both of which the electricity industry invests heavily in -- are the top two end uses for copper in the U.S., according to copper-industry data cited in a 2007 report by the U.S. Department of Energy. As a result, utilities have become a continual target of thieves in search of copper wire to sell in the booming scrap copper market. Frequently, the thefts occur at unmanned electrical substations, which can be found in remote locations across the country. For the past year, Dominion Virginia Power, a Dominion subsidiary that provides electricity to 2.4 million customers in Virginia and North Carolina, has teamed up with Virginia law enforcement officials and other utility companies in an effort to combat copper thievery. Part of their joint strategy is based on advanced data visualization images and visual analytics reports produced by Herndon, Va.-based GeoEye Inc., which uses a combination of information and images captured by satellites, aircraft and ground stations to provide geospatial data and mapping and analytics services to organizations for uses such as antiterrorism, fraud detection and fighting crime. Data visualization is a general term used to describe any technology that lets corporate executives and other end users “see” data in order to help them better understand the information and put it in a business context. Read more of Whatis.com’s definition of data visualization. Dominion Virginia Power has provided details on its facility locations -- it has upwards of 1,000 substations alone -- to GeoEye Analytics, an operation formed after GeoEye’s acquisition of geospatial analytics services firm Spadac Inc. last December. The energy company then furnishes the longitude, latitude, date and time for every incident of copper theft and related damage that occurs at its facilities. GeoEye takes that data and, through the use of predictive modeling, sifts out patterns of activity and behavior to generate a monthly report of the top 10 facilities likely to be targeted next, with supporting images and visualizations. The security team at Dominion Virginia Power uses the findings to help plan its facilities security strategy -- for example, where to install permanent or portable security systems. During 2011, the company has seen a 57% decrease in the total amount of damage compared with the year before, Jenkins said, although he added that the use of geospatial data and visual analytics is just one in a series of measures Dominion Virginia Power has undertaken to help curtail the thefts. Data visualization is becoming an increasingly mainstream technology. For example, the 2011 Gartner Magic Quadrant for Business Intelligence Platforms highlighted the growing momentum of “data discovery” vendors such as QlikTech, Tableau and Tibco Spotfire. Those companies offer tools for mashing up and mining data and creating visual, easy-to-digest reports that tug beyond static charts and graphs. Such products enable business users to “author applications and content themselves, without having extensive technical skills,” said Rita Sallam, a research director at Stamford, Conn.-based Gartner Inc. But advanced data visualization tools also appear to be etching out a more pronounced place for themselves as more and more organizations face an increasing influx of data as well as different data types, including geospatial data. According to a recent survey by The Data Warehousing Institute (TDWI), advanced visualization tools are viewed by many IT professionals, business users and technical consultants as necessary when analyzing “big data.” In fact, Philip Russom, research director for data management at TDWI and the author of a report about the survey, admitted his surprise when a question designed to find the fastest-growing big data technology revealed advanced data visualization as No. 1. “I expected a lot more nerdy, techy, deep database stuff,” Russom said when the report was released last summer. Advanced visualizations push at the boundaries of what businesses can visually produce with basic tools such as Excel. In addition, the level of analytics capabilities that are needed to make sense of the visualizations can vary depending on the use case, Sallam said. “You can find creative ways to visualize data without necessarily having advanced analytics [tools], but sometimes to find advanced patterns and then to visualize that data requires a more sophisticated type of analytics,” she noted. While the analytics reports that GeoEye provides to Dominion include text, most of the content is satellite imagery layered with a variety of advanced data visualizations formatted in a way that’s designed to make it easy for non-analysts to understand them. “The satellite imagery isn’t military grade, it’s more like Google Earth, [and] then has different layers of data containing information, color coding and so on,” Jenkins said. For example, the reports can include overlays showing a facility’s proximity to secondary roads and scrap dealer locations, characteristics that can contribute to a higher risk for thefts. For Dominion Virginia Power’s security team, working with GeoEye’s reports has been an introduction to utilizing geospatial data and visual analytics in general. But even if the security workers were able to produce the reports in-house, Jenkins said the intelligence that Dominion is receiving now likely would be better informed because of the participation of other utilities, such as Verizon, in the analytics program.